A Once in a Lifetime Roadtrip They Will Never Forget. 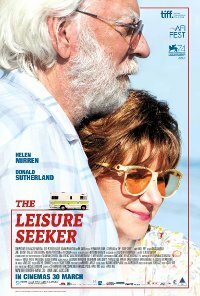 An elderly runaway couple go on an unforgettable journey in the faithful old motor home they call The Leisure Seeker, travelling from Boston to The Ernest Hemingway Home in Key West. They recapture their passion for life and their love for each other on a road trip that provides revelation and surprise right up to the very end. Language Fairly frequent moderate impact crude language used in the context of swearing. Violence Infrequent moderate impact, mainly implied violence. Prejudice Isolated low impact prejudice with clearly disapproving messages.